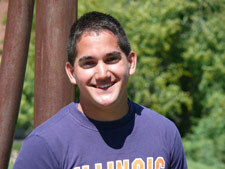 Dallas Castillo is a senior in the Department of Kinesiology and Community Health. The department is definitely unique. The sizes of the classes I have taken are perfect because the teachers get to know you by name and you always find yourself taking a class with someone you know. The faculty is great in informing you of endless opportunities to get involved and really makes you feel welcome. The most beneficial experience within the department has to be my relationships with the faculty members. The advising staff is extremely helpful in pointing you in the right direction whenever you have a question. I became involved with the Mannie L. Jackson Illinois Academic Enrichment and Leadership Program, and it has really opened doors for me. Most of the time I spend in extracurricular activities is spent volunteering through Alpha Phi Omega, a co-ed service fraternity organized to provide community service, leadership development, and social opportunities for college students. When I’m not volunteering, you can find me at the Activities and Recreation Center playing volleyball with my friends from the Recreational Volleyball Club. After I finish my undergraduate degree, I plan to attend graduate school in Occupational Therapy. I have completed an Interdisciplinary Minor in Aging and have also been involved with Dr. Charles Hillman’s research on the link between exercise and academic performance in children. I’ve enjoyed both experiences and can see myself becoming further involved with these populations. I love playing sports and being outside on a nice day. Whether I am running around campus, lounging around the pool at the ARC, or playing hours of sand volleyball, I try to be as active as I can. Other than that I enjoy spending quality time with my friends and meeting new people. It is very comfortable here. One is not intimidated by large classes with hundreds of people in them. You take classes with people you know, taught by a professor who wants to get to know you. The Department of Kinesiology and Community Health is definitely one of a kind.